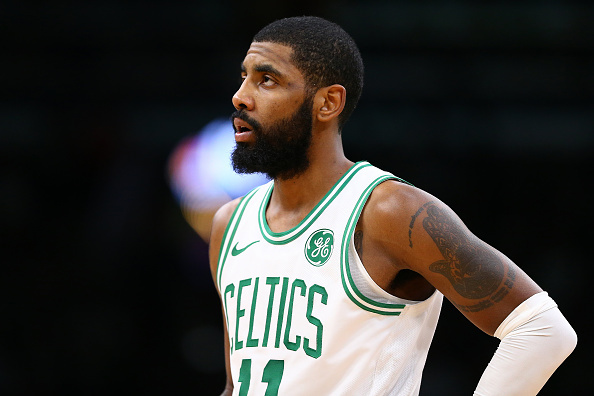 Amid all of the Anthony Davis to Los Angeles Lakers rumors comes word that Boston Celtics' All Star point guard Kyrie Irving is allegedly "genuinely interested" in reuniting with LeBron James. According Ric Bucher, Irving's interest is "for real." “While the news since last summer has been largely about stars not interested in being LeBron [James]’s sidekick — [Paul] George’s decision to re-sign with the Thunder, Jimmy Butler not having the Lakers on his reported preferred list and Kawhi Leonard reportedly favoring the Clippers — a source close to the Celtics confirmed that Kyrie Irving is genuinely interested in reuniting with his former Cavaliers teammate,” writes Bucher. Irving, 26, previously stated that he planned to re-sign with the Celtics this Summer. However, as Yahoo Sports' Chris Haynes reports, "there’s a growing belief of uncertainty that Kyrie Irving will re-sign with Boston." The Celtics have a plethora of young players and draft picks to throw at the Pelicans in a package for Anthony Davis, which would definitely entice Kyrie to stick around. However, they're currently restricted by the "Rose Rule," and are unable to strike a deal for A.D until July 1. That said, rumors are swirling that Davis, who can become an unrestricted free agent in the summer of 2020, does not view Boston as "a top target" and it is believed that he will only commit to signing a contract extension with the Los Angeles Lakers.